Let Liberty Tabletop take you back to a time when Celtic Culture ruled the ancient world. This culture, deep in its roots dates back thousands of years, but is still alive in our modern world. It flourishes through music, art, books, and spirituality. The Celtic pattern serves as a reminder that the Celtic Culture remains in the hearts of many who continue to honor and celebrate a way of life everyday within the modern generation. 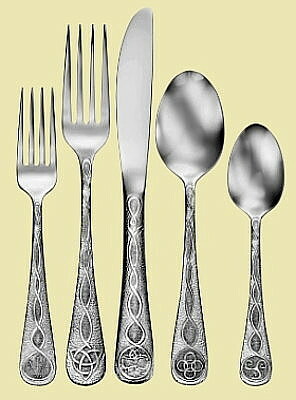 The Celtic Pattern is the newest addition to our beautiful American Made flatware. Staying true to the Celtic world, These �Euro-Sized� pieces with a forged knife will be a conversation starter at your dining table!